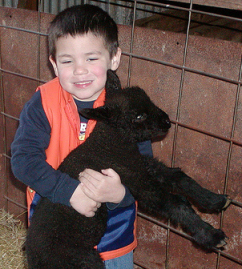 Kate and Michael Lowder have been raising sheep since 1992. 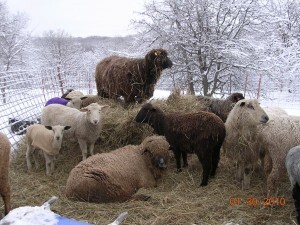 They began with Natural Colored Rambouillets and added Karakuls a few years later. Eventually they acquired several 25% and 50% Wensleydales and Teeswaters from Kate’s mother, Barbara Burrows of Ewes in Color. 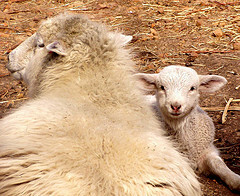 Kate and her mother share a love for colored sheep, and it was with Barbara’s assistance that Kate established her own personal flock in the early 1990s. 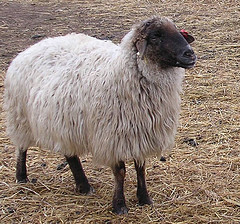 Two Bond Rams were purchased to help bring a bit more length and fineness, and build up the moorit color genetics with the Rambouillet and crossbred ewes carrying the moorit color gene. 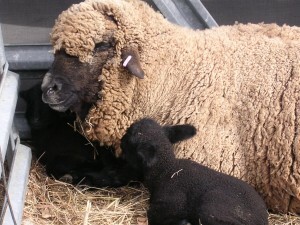 In addition to the Bonds, the Lowders added two moorit badger Rambouillet ewe lambs. With Fall came the 68% and 71% Wensleydale ewes, a 75% Wensleydale ram, and a 75% Teeswater ram. The next spring brought 42 lambs, a good start to the growing farm. Kate and Michael are constantly working to improve the quality of their flock and fleeces through coating or not coating, and selective breeding. The goal to have the highest quality fleeces for hand spinners is one Kate works toward through her breeding program and personal research into hand spinners’ and fiber artists’ desires. as well as her participation in local hand spinners’ guilds, and her independent studies and hobbies in hand spinning, felting, knitting, crocheting, and weaving have provided tremendous insight into the needs and wants of the hand spinners, fiber artists, yarn shops that buy her fleeces, rovings, and yarns. Kate’s involvement in the fiber and shepherding communities is not purely a personal journey, but is also a professional one. 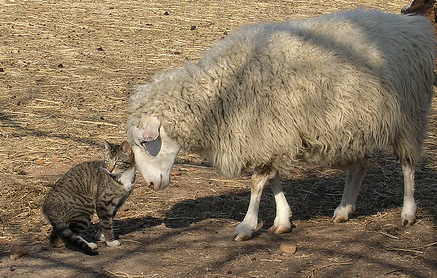 She joined the Natural Colored Wool Growers Association (NCWGA) a year after she began her own flock and has been an enthusiastic member and supporter ever since. 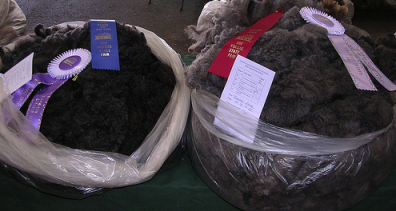 In 2007, the Lowders organized the first “Fiber Christmas in July” at Creek County Fair Grounds, and Kate completed the Natural Fiber Center Canadian Wool Judging Certification for Levels 1 and 2 at Olds College, Canada. Level 2 of the Olds College U.S. Master Spinner’s program was finished and put in the box, and she accepted the position of the 1st Secretary for the American Teeswater Sheep Association. In 2008, she was elected Secretary of the Natural Colored Wool Growers Association–a position she still holds. In 2014, Kate and Michael are busy organizing and sponsoring their eighth annual “A Fiber Christmas in July,” a fiber festival which celebrates all types of fiber arts and which has grown a bit each year.